Christy Havranek is the Photo Director at HuffPost, where she oversees a team of photo editors and photographers. She has 18 years of experience in the photo business, having worked at NBCUniversal, Frommer’s Travel, Polo Ralph Lauren and Bloomsbury Publishing, among others. Most recently, she juried the Lenscratch exhibit “Good Manners,” the 2018 LensCulture Street Photography Awards, and Photolucida's Critical Mass 2018. In October, Havranek will return to CENTER's Review Santa Fe, where she'll present a two-day workshop aimed to help established photographers reach the next level in the editorial space. Jess T. Dugan: Hi Christy! Thank you so much for taking the time to speak with me today. You are currently the Photo Director at HuffPost. How did you discover your passion for photography, and what was your path to getting to where you are today? Christy Havranek: Hi Jess! Great to chat with you. Well, I’ve always loved photography – I took both black & white and color classes way back in high school, but ultimately studied Animation. I grew up in an artistic household – my Dad always had a Minolta or Nikon in hand and has taken some really fantastic photos over the years. I didn’t realize that photography was basically like a second language for me until after I graduated college and couldn’t find a job in Animation without moving to LA. I started working as a research assistant at Retna – the music archive that, at the time, was run by Julie Grahame. Pretty much everything that prepared me for a career in the biz, I learned from her. From there I went on to stay in photography, working across different industries: TV, book publishing, fashion, travel publishing, and now news. I can’t believe it’s been 18 years. JTD: Although I imagine your days vary quite a bit, I’m going to ask you this question anyway: what does a typical day look like for you? CH: You’re right, my days really do vary. A typical day can include everything from discussing art for the HuffPost Instagram account with colleagues on multimedia and audience, topic-based brainstorms, working with my team on both big and small projects, determining visual direction for a story, chatting with Product or Front or Legal and – of course – keeping our heads above water in this bonkers news cycle. JTD: What is your process for putting together photo features? How do you identify stories or topics to work on and then identify the appropriate photographers for the piece? CH: My team works closely across the newsroom, so it’s a constant collaboration. The genesis of a photo-driven story can come from an art request from editors, a pitch meeting, a Slack message, a chat by the coffee pots, etc. 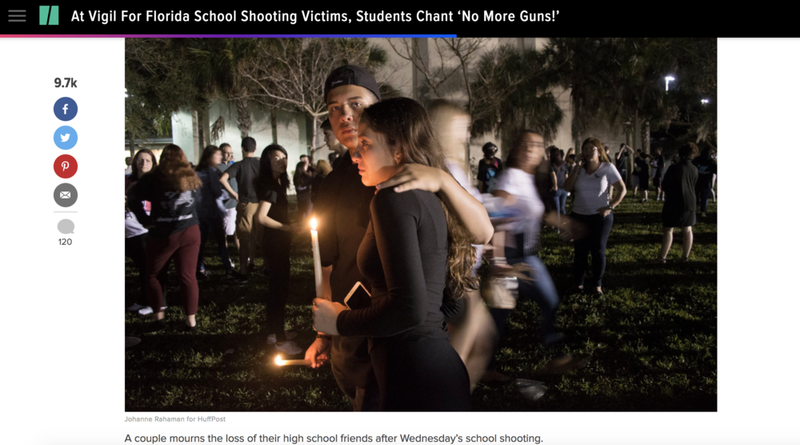 I’d like to think that, overall, HuffPost focuses on stories that not only will resonate with our audience, but ultimately ask: what issues, voices or communities can be elevated and brought into the light by telling this story? What institutions are we holding to task? Humans are visual creatures and photography is a great way to draw someone in and expose them to issues they may not be aware of. With that comes the responsibility to visually tell the story the best way possible, which plays into who we reach out to for the assignment. JTD: Along those lines, how do you discover new photographers to work with? What qualities do you look for, both in the photographer and in their work? CH: I meet a lot of great photographers at portfolio reviews and photo events. Word of mouth and referrals, too. We’ll use Women Photograph, Diversify Photo, Blink, etc. Instagram is, of course, less a searchable database than it is a place of utter chance and random discovery, but I’ll go down a rabbit hole and emerge with a list of people to keep in mind. It may sound glib, but I look for photographers with unique perspectives, folks who aren’t getting the obvious shot, but rather seeing and capturing something completely different, and in their own way. Those differences in ways of seeing, and experience, make for compelling visual storytelling. JTD: Do you often issue assignments to photographers or are you primarily pulling from work that has already been created? CH: Both! We are regularly assigning photographers for long form editorial pieces and photo-based pieces, and of course we license existing work along the way, too. JTD: It seems that there has been a significant shift around working as a news or editorial photographer, and that it is much more difficult to find consistent employment than it used to be. Along these lines, what changes have you noticed in the industry? Do you view the shift as positive and exciting, or has something been lost in this transition? CH: This is a big question, and I’m not entirely sure how to answer it. Some of the photographers I see working steadily are those who, I think, are doing a very good job of using social media as a promotional tool and as a genuine extension of themselves and their work. One of the biggest industry changes, which I’ve talked about before, is the erosion of newsrooms across the country – this includes writers, editors, photo, and video. Whether it’s a local paper shuttering or the New York Daily News axing 50% of its staff, we’re seeing cuts like crazy, and it doesn’t help that we have a president who calls the media ‘the enemy of the people’. Something’s gotta give, but I don’t know what that change will look like. Maybe a collective backlash can lead to renewed respect for, and a revitalization within, the news industry? That’s the optimist in me. Part of the problem, though, is that people in power don’t necessarily see ‘news’ as synonymous with ‘profit’ and may not want take the time to find that balance. That’s the realist in me. JTD: As you know, the mission of the Strange Fire Collective is to promote work by women, people of color, and LGBTQ artists, writers, and curators. There has been a lot of discussion about increasing diversity in the photography world at large, particularly within editorial and assignment work. Do you consciously seek out a diverse group of photographers to work with? What are your thoughts about diversity, inclusivity, and access within the photography world more broadly? CH: I absolutely do, yes. For me, it’s about being thoughtful and intentional. It’s important to think holistically about a story, how it should best be told and by whom, rather than “oh we just need to find someone to shoot this.” Because if that’s how you’re approaching it, why even bother with visuals if it’s sort of throwaway, and not an integral part of the process? For far too long, people of color, women and native communities have not been given the same volume of opportunities for paid assignment photo work. Those of us hiring should be doing everything we can to change that. It’s not hard. Representation and diversification behind the lens is vital to realistic and rich storytelling. JTD: What advice do you have for photographers trying to get their work in front of editors? CH: Know your audience! I say this all the time, everywhere, but it’s true. Make sure what you’re pitching is relevant to the outlet you’re pitching to. Also, be patient, flexible and realistic. We can’t respond to every pitch or email, but that doesn’t mean we don’t read them or look at your work. JTD: What are you currently excited about and working on? What’s on the horizon for you? CH: I’m really excited to keep pushing photo at HuffPost as far as possible. Two recent examples, both outside the realm of photojournalism and both written by my very talented colleague Matt Jacobs – are celebrity profiles. 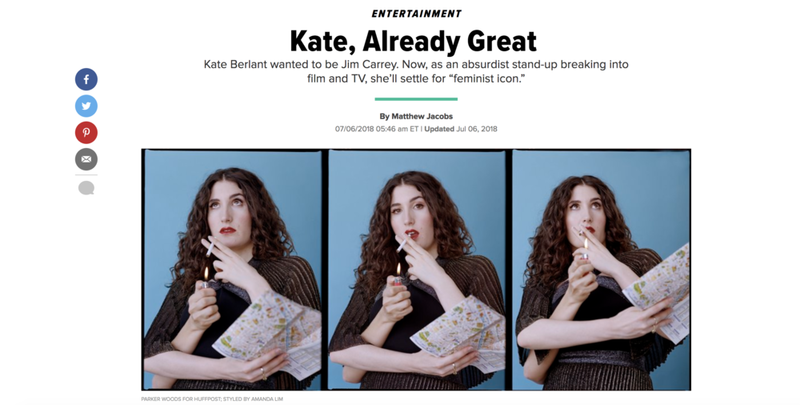 The first was with comedian Kate Berlant, the second and most recent is a shoot with the actor Raul Castillo. More broadly, we’re launching a sort of follow-up to our 2017 bus tour, this time around smaller and focused on midterm elections, which I’m looking forward to working on. I’m a juror for Photolucida’s Critical Mass, which is concluding soon. In October, I’ll be at Review Santa Fe doing portfolio reviews. I’m honored to be co-presenting a two-day workshop for photographers, for the second year in a row at Review Santa Fe, alongside the wonderful Mary Anne Redding. JTD: Excellent, thank you so much for taking the time to talk with me Christy!